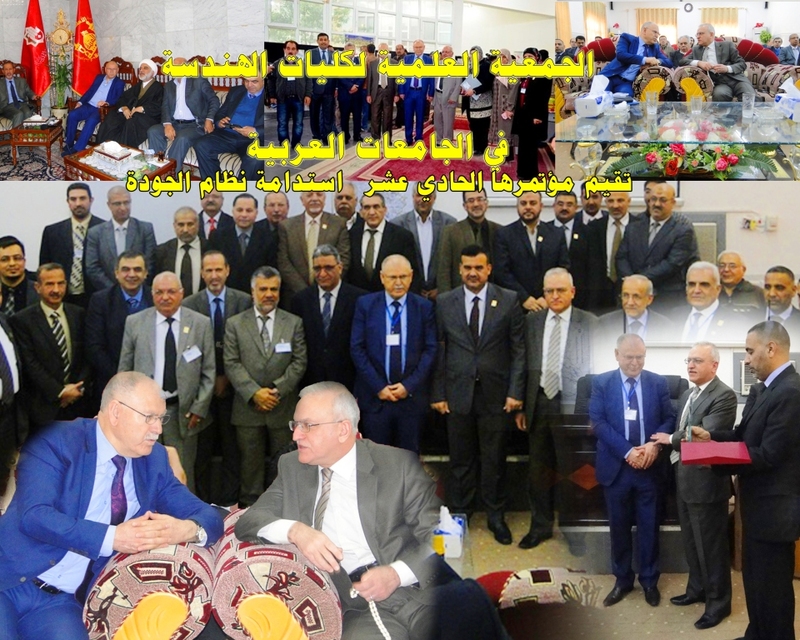 The scientific association of Engineering colleges in Arab universities , which is one of the scientific associations of the counterpart colleges that belong to Association of Arab Universities, where its headquarter is the college of Engineering, University of Baghdad , has held its eleventh conference under the slogan “Assurance of the quality of engineering education in the Arab homeland” in collaboration with the college of Engineering at the University of Kufa.It is the first conference hosted by the college of Engineering, University of Baghdad in the province of Najaf . Dr. Sultan Abu Orabi Al-Adwaan, the general secretary of the Association of Arab Universities as well as the president of Baghdad University professor Dr. Alaa’ Abdulhussein Abdulrasul have attended the conference .The president of the university has praised the exerted efforts made for the success of the conference and called for promoting the role of universities in raising the efficiency of education in the Arab homeland as well as to activate the role of scientific research to interact with the needs of the institutions and governent and private companies alike and has invited the General Secretary to visit University of Baghdad and other Iraqi universities for cultural and knowledge exchange at all levels . Dr. Abu-Orabi has mentioned the role of the General Secretariat of the Association of Arab Universities in the promotion of the level of higher education in Arab universities through the various activities carried out by the association , the most important of which is the international conferences and specialized workshops, seminars and student activities and cooperation with organizations and associations as well as academic international organizations. The activities of the conference of the first day have included welcome speeches by the President of the University of Kufa, Prof. Dr. Aqeel Abd Yaseen , then the general secretary of the Association of Colleges of Engineering and Dean of the college of Engineering/ University of Baghdad, Dr. Ahmed Abdul-Sahib Muhammad Ali has delivered a welcome speech and spoke about the message and the goal of the Scientific Association to support the colleges and institutes to prepare an Arab engineer who is capable to serve the Arab nation and achieve their aspirations through cooperation to raise the level of engineering education in the Arab homeland and to encourage scientific researches and holding specialized scientific seminars, conferences and taking care of the Arab and Muslim heritage as well as to encourage the establishment of specialized research centers, in addition to coordination among the members of the Association in international bodies and conferences and the work to establish a network link of information. At the end of his speech, he thanked all the exerted efforts made by the employees of the college of Engineering / University of Baghdad. He also has thanked the governor of Al- Najaf , the Governor of Baghdad and Prof. Dr. Aqeel Abd Yassin, presdient of the University of Kufa for sponsoring the conference and has thanked also Dr. Alaa’ AbdulHussein, presdient of the University of Baghdad for his personal following up of the conference , the ladies and gentlemen who are members of the preparatory and executive Committees from both the University of Baghdad and Kufa and the threshold of the Holy Alawi and Husseinian and Abbasid thresholds General Secretariat of the mosque of Kufa, the religious shrines and administration of the airport of the Holy Al-Najaf. Then the activities of the first session have begun under the chairmanship of Prof. Dr. Ali Abdullah Saleh Alkilidar , the former generalsecretary of the Association of Colleges of Engineering , Assisst .Prof. Dr. Ali Abdulmohsen Al-Asadi as a rapporteur.The first lecture of Professor Dr. Shiban Haikal, dean of the college of Engineering at the Lebanese University entitled (the experience of the College of Engineering at the Lebanese University ), followed by a lecture by Dr. Pierre Gideon from the University of Mrs. Louisa, one of the private Lebanese universities and finally lecture of assisst. Prof.Dr. Mohammed Attia Al-Saraj , Dean of the college of Engineering Al-Khwarizmi entitled (the reality of scientific research in Iraq from 1996 to 2012). On the sidelines of the conference , the eleventh meeting of the deans of the colleges of Engineering, the Association members has been held and elections to choose the members of the executive body has been made . Seven deans were nominated for the committee and membership of the Executive Committee has been won by each of Prof. Dr. Ahmed AbdulSaheb Muhammad Ali / University of Baghdad, General Secretary as President , Prof. Dr. Shiban Haikal / Lebanese University as a member , professor Dr. Riad Al-Anbari / University of technology as member , Prof. Dr. Ali Hussein Otaioa as member and Prof. Dr. Muhammad AL-Anbari / Mustansiriya University as member and Prof. Dr. Kadhem Fanteel / University of Babylon as member and assistant professor Dr Muhammad Attia Al-Saraj / University of Baghdad as member. On the second day , works of the second session of the conference had begun on Dr. Muneer Al- Mudhafar Hall in the College of Engineering at the University of Kufa, headed by Prof. Dr. Hassan Hadi Al-Alaaq and professor Dr. Hassan Mahdi Al-Khateeb as rapparteur of the session where Dr. Sultan Abu-Orabi, general secretary of the Association of Arab Universities has delivered a lecture entitled ” reality of Higher Education and Scientific Research in the Arab homeland ” where the higher education and scientific research sector faces many problems and major challenges such as lack of clarity of the priorities and strategies of scientific research, insufficient time and lack of funding , lack of awareness of the importance of scientific research quality and lack of networking opportunities and databases in addition to the limited international cooperation and the migration of scientific competencies , explaining that it has become necessary to focus on this sector and to support researchers, and working to increase the efficiency of scientific research in Arab universities, and the application of quality assurance and accreditation programs to ensure academic standards in order to get a safe level education outputs to ensure competitiveness in the job market for graduates. Then a lecture of the Council of quality assurance adviser at the General Secretariat of the Association of Arab Universities Prof. Dr. AbdulSalam Jacob Muslim Ghaith entitled ( standards of assurance quality of academic programs in universities and colleges in the Arab homeland) has been delivered .After that a lecture of Prof. Dr. Ali Hussein Otaioa ,Dean of the college of Engineering University of Kufa Dr. Ali Naji Al-Attia entitled “to adopt the learning that based on outcomes of education to ensure the quality of engineering education and then a lecture of the researcher assisst. prof.Dr. Ali Al-Tamimi, college of Engineering, University of Kufa, entitled “unified Arab bui codes of construction and the importance to be included in the curricula of engineering colleges in the Arab countries ” has been delivered. Then the souvenirs and awards have been distributed and the first prize winner has been announced of the scientific competition for the best scientific research of 2014 which is obtained by assistant professor Miqdad Tariq Jijan at the University of Technology. Later there has been a tour in Kufa, visiting the landmarks and religious shrines in the holy Karbala. Mr. Governor of Najaf, Mr. Adnan Abdul Khudair Abbas Zurfi has attended the conference on the first day as well as a number of MPs in parliament as the Minister of Water Resources Prof. Mohsen AL-Shammari, Mr. Baghdad University president ,professor Dr. Alaa’ Abdul-Hussein has attended the conference on the second day , in addition to the presence of Mr. Secretary General of the Association of Arab Universities Dr. Sultan Abu Orabi , who praised the role of the members of Association of Arab Universities to the success of this conference, referring to the roles of the Secretary General of the Association of Colleges of Engineering Prof. Dr. Ahmed Abdul-Sahib and consultant Dr. Shahla Ismail Ibrahim to overcome all difficulties and facilitate the travel of the Arab delegations to attend the conference. 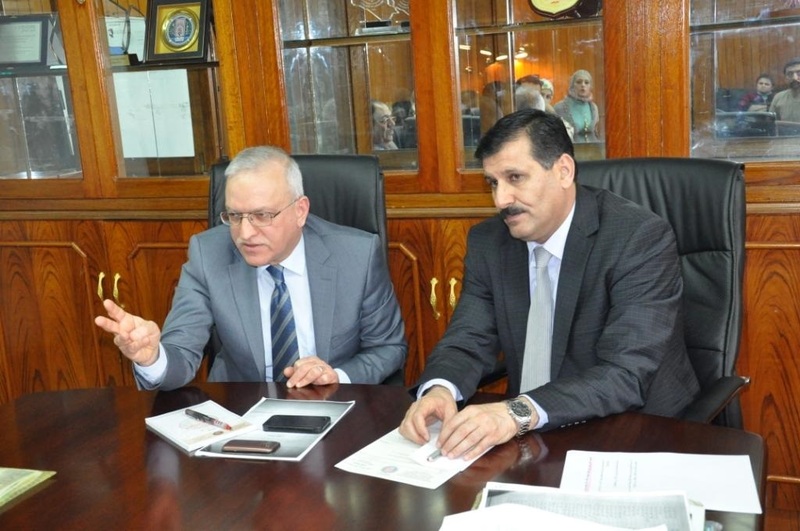 The president of Baghdad University professor Dr. Alaa’ Abdulhussein Abdulrasul has discussed with the Committee of parliamentary education the most significant developments and achievements of the University of Baghdad. The president said during his receiving of the member of the Education Committee in the Parliament , Dr. Mohammed al-Shammari “there is a constant communication between the university and the Committee of Education to serve the scientific process which aims to serve a citizen who will see the graduates take advantage from the science and the possibilities from the University. On the other hand, Al- Shammari stressed that, “the education committee in the parliament finds a great cooperation from Baghdad university in the understanding of the problems and observations from the working faculty members of the university of Baghdad’s formations and that the committee is working to overcome the difficulties and find common mechanisms designed to sustain and develop the academic work to serve the labor market “. A series of sermons and human and intellectual lessons that the students have received in many colleges , institutes and research centers when they revive the commemoration of the anniversary of the martyrdom of pure and honest Fatima Al-Zahra’ ( peace be upon her), where the events, courses and multiple and diverse scientific and demonstrations have been held, which have formed for the University an opportunity in the intellectual and academic progress. College of Engineering and the Institute of Psychological and Educational Research, college of Physical Education, the College of Science for Girls, the College of Administration and Economics, the College of Agriculture, the College of Physical Education for Girls and other colleges and institutes in our university has set up great memorable situations for this anniversary. All the girl students and faculty members of the college have participated and under the supervision of the deanery of the colleges where there have been many events and activities in this anniversary where a number of lectures, seminars, poems and speeches have been delivered, and the literary and theatrical works have been provided for Our Lady Fatima Al-Zahra’ ( peace be upon Her ). Dr. Hazim Doz, the thinker and specialist in the science of human energy from the University of California has delivered several lectures at the university where he has focused on the positive energies emitted from our pure Lady to the girl students of the university. He has explained to the website that all students acquire sermons, as well as creative human thought once belonging to the intellectual Muhammadiyan doctrine. We discover that there are a lot of Exploits which have achieved the positive energy with the revival of such ceremony. With the anniversary of the martyrdom of the great honest our pure Lady Fatima Al-Zahra’, the daughter of the greatest prophet Muhammad (peace be upon him and his family), our university recalls this painful anniversary and holds the scientific demonstrations for this important occasion annually in all colleges, institutes and scientific centers. Radio of Baghdad University hosts the website to talk about the criteria of the Webometrics adopted in a new global ranking of the University. Al-Kindi medicine at the University of Baghdad participates in health research course at the University of Imperial in the United Kingdom. Issuing a book on the aesthetics of form in contemporary theater by the college of fine arts. A research team from the college of agriculture discusses development of wheat fields in Diwaniyah. An instructor from the university of Baghdad gets the title of “ambassador of peace” for 2015. Seminar at the Natural History Center at the University of Baghdad about ways to deal with electronic terrorism. Baghdad University Museum Receives its visitors and guests after rehabilitation to be acquainted with the achievements of the university and its cultural heritage. Master thesis at Baghdad university addresses the problems of controlling greenhouse temperatures to reduce energy consumption . Researchers from the university of Baghdad registered a new patent that finds solutions to prevent the corrosion of steel iron. University of Baghdad discusses with the Hungarian embassy prospects for scientific and cultural cooperation. The scientific reality of English department’ female students: a workshop in the college of education for women. Al-Hakim hall at the university of Baghdad witnesses a great carnival on the occasion of the victories of our armed forces and the heroes of the popular crowd. Head of the house of representatives congratulates the Iraqi woman in her international day and promises of new legislation in a great celebration organized by the university of Baghdad on this occasion. Specialized media organization chooses the dean of college of medicine as the best medical academic figure. In solidarity with the security forces and the popular crowd, college of law organizes a solidarity stand.